The NBA Draft lottery isn't until next month, but the NBA conducted a handful of tiebreakers over the weekend regarding it. The Cleveland Cavaliers (19-63) won a tiebreaker with the Phoenix Suns, although I'm not sure why that matters since the three-worst teams - which is those two and the Knicks - all have the same chance of winning the lottery. I guess it would matter on how far a team could slide. The Pelicans (33-49) won a tiebreaker with the Grizzlies and Mavericks (Memphis won over Dallas) and the Hornets (39-43) won one over the Heat and Kings (Miami won over Sacramento). The lottery is May 14 at 8:30 p.m. ET from Chicago. The Knicks already have said that Patrick Ewing will represent them. Why do I think there will be another conspiracy theory if New York wins it it and lands Zion Williamson? Of course, many believe the first draft lottery was fixed for the Knicks to land Ewing at No. 1 overall in 1985. Here's a look at Tuesday's three Game 2s in the first round of the playoffs. An 8 p.m. ET start on TNT. There were a few surprises over the weekend in the postseason, none more so than the Magic going to Toronto and winning 104-101 as 9.5-point underdogs. D.J. Augustin, not All-Star Kyle Lowry, was the best point guard on the floor with 25 points, including the tiebreaking three-pointer with 3.5 seconds remaining. Never would have seen the Magic winning that game with All-Star big man Nik Vucevic and Aaron Gordon combining for only 21 points. Michael Carter-Williams, who has become a solid bench contributor, had his nose bloodied in the win but will be good to go Tuesday. He had 10 points and five rebounds in 18 minutes. Perhaps we should have seen that loss coming for the Raptors as they are just 2-14 all-time in playoff openers. Kawhi Leonard didn't even hit rim on his three-point attempt at the buzzer. He finished with 25 points, while Pascal Siakam had 24 and nine rebounds. However, Serge Ibaka had only five points and Lowry was shockingly scoreless on 0-for-7 from the field. Yet he was the only Raptors starter with a positive plus/minus rating (plus-11). Toronto is now 1-6 all-time when starting a first-round playoff series at home. The Raptors have responded by posting a 5-1 record in the next game. Key trends: The Magic are 5-0 against the spread in their past five games. The Raptors are 1-4 ATS in their past five vs. teams with a winning record. The "over/under" is 7-1 in the Magic's past eight. A 9 p.m. ET tip on NBA TV. The Spurs were 16-25 on the road this regular season, worst of any playoff Western Conference playoff team by far, while the Nuggets were an NBA-best 34-7 at home. So, naturally, the Spurs stole Game 1, 101-96. DeMar DeRozan had 18 points, 12 rebounds and six assists, and LaMarcus Aldridge 15 points and eight rebounds. DeRozan became the first Spur to notch a double-double in his first playoff game with the team since Nazr Mohammed did it in 2005. The rebounds were a playoff career high. San Antonio coach Gregg Popovich made sure that Nuggets star big man Nikola Jokic was double-teamed just about all of Game 1, and it worked as Jokic had just 10 points on nine shots, although he did have 14 rebounds and 14 assists. Jokic became just the fourth player in NBA history to triple-double in his playoff debut and the first since LeBron James. Jamal Murray was just 8-for-24 from the field in his playoff debut. Denver shot 42 percent overall and 21.4 from deep. The Nuggets have now lost seven of their last 12 home games against San Antonio. Key trends: The Nuggets are 2-6 ATS in their past eight at home. The under is 10-1 in the Spurs' past 11 vs. the West. It's 7-1 in Denver's past eight at home. Game starts at 10:30 p.m. ET on TNT. I'll admit that I was one of those people who thought the Thunder would win this series because the Blazers lost center Jusuf Nurkic to a season-ending injury not long ago and OKC was 4-0 in the regular-season series. Maybe Oklahoma City still will win the series but it is down 1-0 after a 104-99 loss in Portland on Sunday. 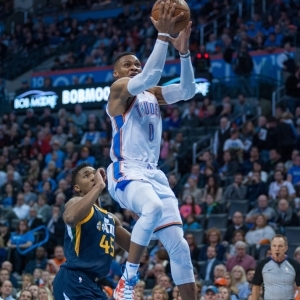 Russell Westbrook had the ninth triple-double of his playoff career with 24 points, 10 rebounds and 10 assists. He did tweak his ankle but played through it. Paul George just doesn't look right with that bothersome right shoulder and was 8-for-24 from the field and fouled out (he was a game-time call). Dennis Schroder, the key bench player, was only 5-for-17. The Thunder shot 39.8 percent overall and were 5-for-33 from deep. Won't win many games firing that many bricks. Portland got the usual terrific production from Damian Lillard (30 points) and CJ McCollum 24 points), but the clear story was Enes Kanter stepping up big in Nurkic's spot with 24 points and 18 rebounds. The Blazers had lost 10 straight playoff games. This marks the first playoff series between these teams since the Thunder franchise moved from Seattle to Oklahoma City prior to the 2008-09 season. The only Western team in its current city that Portland now hasn't faced in the postseason yet is Sacramento. Key trends: The Thunder are 4-9 ATS in their past 13 road games. They are 2-5 ATS in their past seven in Portland. The over is 15-5-1 in the Blazers' past 21 at home.